Nestled within the Mayacamas Mountains, part way between Santa Rosa and Calistoga, the Hans Fahden Vineyards is set within a sweeping viticultural landscape that boasts stunning views across to Mount St. Helena. It’s a combination of surrounding natural beauty and architecture that has been meticulously designed to create an exclusive and intimate place of gathering, making Hans Fahden Vineyards the perfect backdrop for weddings. The winery dates to 1912 when it was first purchased by German immigrants, Hans and Marie Fahden. Despite initially growing grapes, prohibition in the 1920s forced them to transform the crop into walnuts and prunes, and it wasn’t until their grandsons returned to the land that Cabernet Sauvignon grapes were re-planted and the family tradition reignited. The third-generation owners of the Hans Fahden Vineyards, Antone and Lyall Fahden, have designed exquisite gardens that were inspired by Monet’s impressionist paintings of the gardens of Giverny. With a French country-style feel, they are the ideal location for your guests to mingle as they await your arrival. The gardens have been planted to ensure a distinct group of flowers are blooming each month, resulting in the scent of roses, poppies, petunias, and irises wafting through the air. For small wedding gatherings, the wooden “teahouse”, beautifully draped in grape vines, wisteria and climbing red roses, creates a cozy and intimate atmosphere, while larger groups can wander down towards the pond where an expansive terraced lawn awaits. Flanked by beds of lavender, roses and California poppies, there is plenty of room for guests to either sit or stand as they witness your exchange of vows and soak up the magnificent surrounds. Alternatively, say “I do” on Hans Fahden Vineyards’ covered bridge that spans the lily pond, while egrets and mourning doves wade in the waters below. When it comes to your reception, the Hans Fahden Vineyards is beautifully designed to cater to all your needs. Your guests will be invited into the spectacular grand room, with French doors overlooking the stunning gardens and a warm, pine and redwood interior. You package comes complete with a baby grand pianist to entertain as your wedding party sips aperitifs and nibbles on gastronomic delights, unaware of the surprise that awaits. 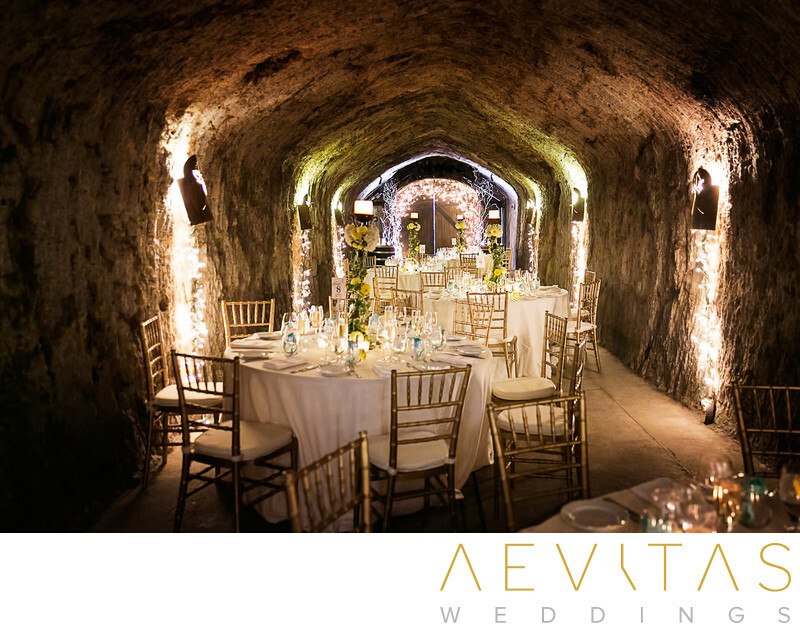 Through the impressive Douglas fir wooden doors at one end, a rustic, volcanic ash cave is beautifully-appointed to create an enchanting, magical atmosphere. Tables lit with elegant candelabras and exuberant floral decorations, combined with rustic wine barrels and the aroma of aging wine within an interior that is warm and inviting, make Hans Fahden Vineyards the perfect venue for your wedding.